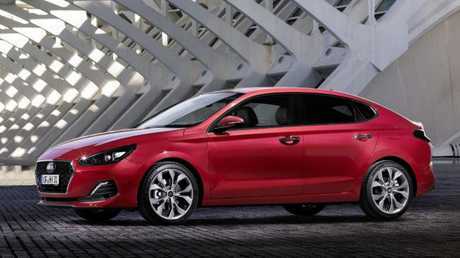 Hyundai is looking to shake up the hot-hatch market. Pic: Supplied. ONE corner is all it takes to confirm Hyundai's first genuine hot hatch is the real deal. The oversized brakes bite hard, the steering is precise, the adaptive suspension keeps the car flat as it changes direction and the mechanical limited slip diff slingshots you out of the corner without scrabbling for grip. If you were in any doubt, a couple of rally-car style blast from the exhaust seal the deal. The i30N is a walk on the wild side for Hyundai. The brand, which built its reputation on sensible, good value A to B cars, is stepping out of its comfort zone and taking on some of the most revered nameplates on the road. 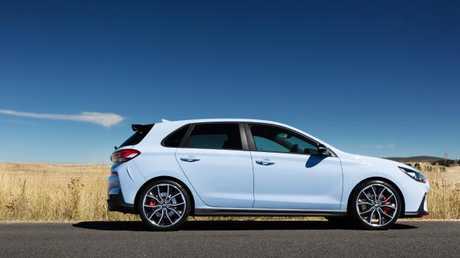 Cars in the i30N's sights include Volkswagen's legendary GTI, Subaru's cult car, the WRX and Renault's manic Megane RS. 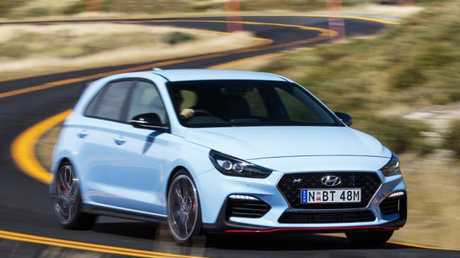 Corner carver: Hyundai’s i30N is a change of direction for the company. Picture: Supplied. 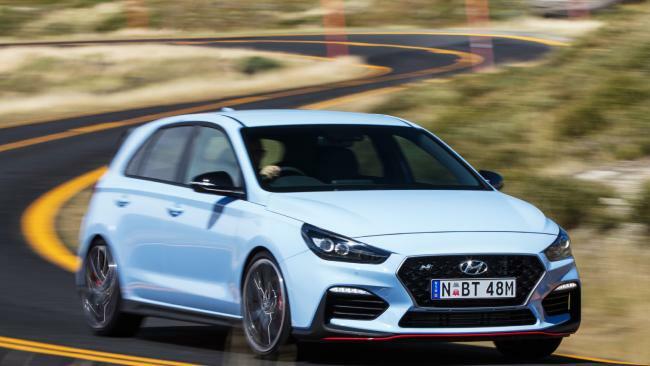 Hyundai chief executive, JW Lee, admits the i30N is an "underdog" in this company. It's an honest assessment of the car's credentials, but also a canny one - he knows Aussies love an underdog. "Personally I never dreamt of competing with Volkswagen but nowadays were are competing with them and other top-level manufacturers," he says. But if you think Hyundai is about to enter the battle meekly, think again. 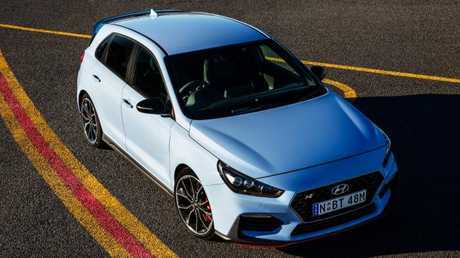 Hyundai engineers, led by the infectiously passionate German Albert Biermann, have thrown everything bar the kitchen sink at the i30N to tempt enthusiasts. Long and winding road: the i30N is a blast through the bends. Picture: Supplied. 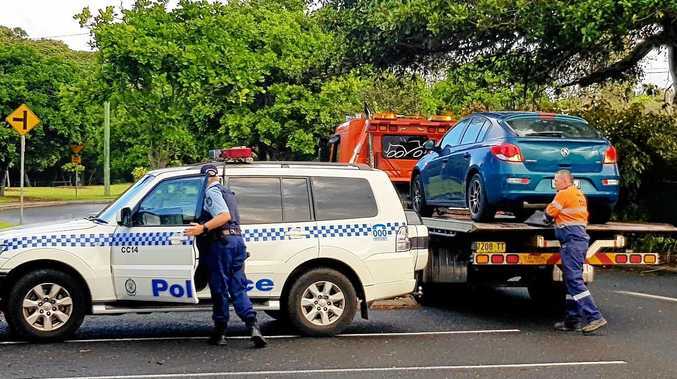 Along the way some of the niceties expected of a $40,000 car have been tipped out, sacrificed for go-fast gear. There are no front parking sensors, you start the car with a conventional key and rear air vents are another omission. In the way of compensation, there are a mechanical limited slip differential, bespoke 19-inch Pirelli tyres and brake discs the size of those dinner plates you get in fancy restaurants. There's no powered driver's seat, but there is a rev-matching button that will blip the throttle on downshifts to deliver optimum revs for blasting out of corners. It's all part of Biermann's plan to make the novice feel like a pro behind the wheel, as he explained at a media prototype drive last year. Track weapon: Hyundai is encouraging owners to drive the car on race circuits. Picture: Supplied. "The key element is to have a fun-to-drive car for the not-so-experienced sport drivers," he says. "The car should be approachable, you should have confidence in the car and you should have an enjoyable experience when you push it to the limit. The car gives you good feedback and is very precise." The feedback sounds completely feral at times. In N mode, the active exhaust lets out a crack on downshifts that echoes through trees like a 12-bore shotgun. A rear wing and diffuser help with downforce. Picture: Supplied. The engine output numbers are impressive: 202kW of power and 353Nm of torque, with another 25Nm available of boost available in short bursts for overtaking. The straight line performance is dulled slightly by the car's weight - it's not as light as VW's GTI - but it's still quick enough for the company it will keep on the showroom floor. 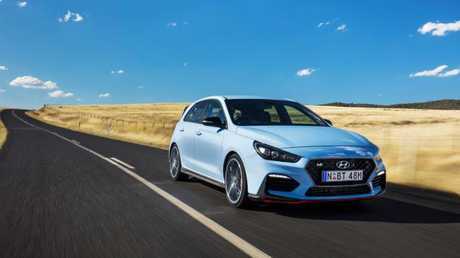 Hyundai claims it will reach 100km/h in 6.2 seconds, which compares with 6.4 seconds for the similarly-priced Golf GTI. We'll reserve judgment until we've put the stopwatch on both in similar conditions, but by the seat of the pants, the engine feels strong and willing, especially in the mid-range. 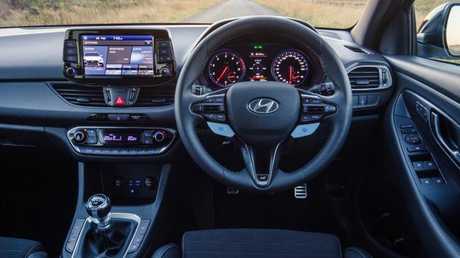 At times that's enough to make the steering wheel tug a little in the hands, but overall Hyundai has done an impressive job getting that much power through the front wheels without too much squirming under full throttle. The i30N is more about fun than outright pace. Picture: Supplied. It fits with the brief as well. Biermann, a former BMW M Division boss, says the car is more about beats per minute than revolutions per minute. In other words, it may not pin your ears back like some but it will make the ticker skip a beat. If you want the luxuries, you can pay another $3000 for them (or $5000 if you want a sunroof) but Hyundai's focus was on making all the performance available for the cheapest price. At $39,990, the Hyundai lines up enticingly against the established players. It's not completely devoid of niceties either. It has Apple Car Play and Android Auto, snug cloth sports seats, a digital speedo and satnav with speed warnings to keep the licence intact. The cabin isn’t as racy as some of its rivals. Picture: Supplied. Having said that, the cabin doesn't scream sporty. There is some subtle blue stitching on the seats and the manual gear shifter has a nice metallic look and feel, but there are no splashes of fake carbon fibre, colour trim highlights (as on the Veloster) or chunky sports steering wheel. Grey on grey is very much the theme, although it's brightened up by the large centre screen that houses an encyclopedia's worth of details about the car's performance. Adjustability is the unique selling proposition for the i30N. There are five driving modes - eco, comfort, sport, N and N Custom. In N Custom mode, you can adjust seven performance parameters in a mind-boggling array of 1944 combinations. 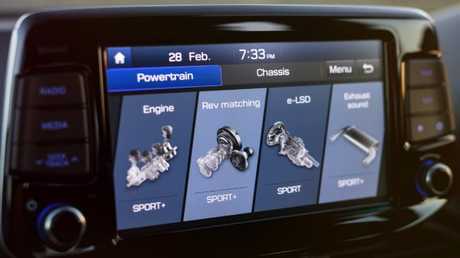 Drivers can scroll through the screen menus to set the car up to their personal tastes. Picture: Supplied. In the "engine" menu, you can adjust the engine and throttle responsiveness, the rev matching feature, the limited slip diff and the exhaust sound. Switch to the "chassis" mode and you can adjust the suspension, steering and stability control intervention. It sounds a little gimmicky, but over roughly 400km of twisting Victorian alpine roads, we tried a number of combinations and could feel the adjustments whenever we made a change. If the sports suspension was too harsh and bouncy on bumpier roads, the softer setting felt more composed. The steering feel was also a matter of taste; we preferred normal to the sports setting, which added weight without providing much extra feel. Sports wheels and big brakes give a hint of the car’s performance potential. Picture: Supplied. Our test drive only covered country roads and while the suspension felt compliant enough at high speeds, it was a little jiggly when pottering through towns. We'll need some seat time in the city to make a final call. 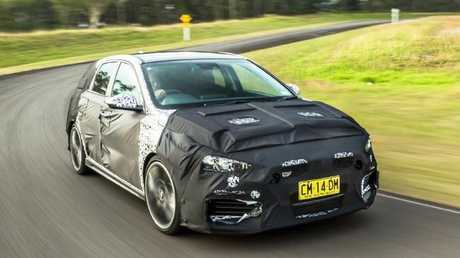 Australia has a unique suspension tune for the i30N, global recognition of the awfulness of some of our road surfaces. Lee says the manual-only i30N - an eight-speed dual-clutch auto won't arrive until next year - is more a halo car than volume seller. "We are not expecting good volumes with this car - maybe 50 cars per month or 100 cars per month - but if they are very happy with the brand then surely they are going to be our evangelists," he says. It's not perfect - and the lack of an auto limits its appeal to city buyers - but the i30N delivers plenty of thrills at a competitive price. It should give the established players a real run for their money. Eventually, more models will get the N treatment. Picture: Supplied. 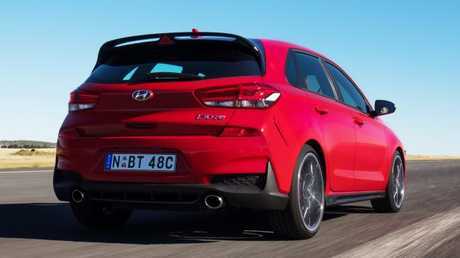 Later this year, a fastback version of the i30N will arrive, then automatic versions of both the hatch and fastback should follow next year. The 8-speed dual-clutch auto could be the catalyst for less powerful, more luxury versions of the car. 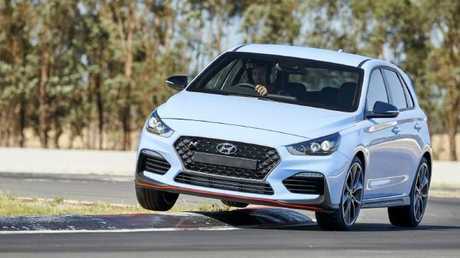 A Veloster N is unlikely as it is only being built in left hand drive, but eventually we should also see an all-wheel-drive model with even greater performance - a Golf R competitor. Local versions have specially developed suspension. Pic: Supplied. Australian i30Ns have a suspension tune unique in the Hyundai world. Initially there was a single tune available for all markets, but Australian engineers managed to convince head office our bumpy back roads, potholed city streets and aggressive speed humps required a softer tune. The local team evaluated 11 front and nine rear suspension set-ups both in Australia and on Germany's famed Nurburgring before settling on the tune.